Tesla Model S Performance, Engine, Ride, Handling | What Car? Being an electric car, the Model S is incredibly quiet in comparison even with the best luxury limousines. When you’re stationary, there’s no noise at all, and it remains free of vibration when you pull away. There is some road noise, though, which is highlighted by the lack of engine noise, but it's quieter overall than the [I-Pace](https://www.whatcar.com/jaguar/i-pace/estate/review/), especially at low speeds. 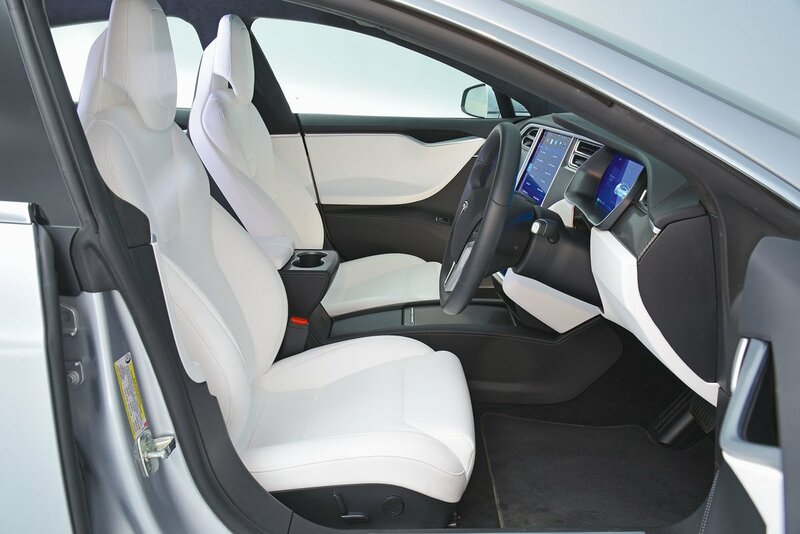 As with all electric cars, you get seamless acceleration unpunctuated by gear changes. That's because electric motors deliver their maximum torque right from zero revs upwards, so there’s no need for the series of gears that normal combustion engines, with their peaky torque deliveries, require. 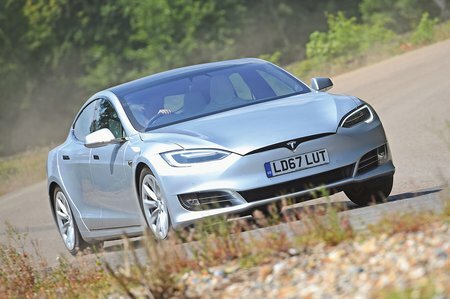 That instant hit of low-end torque also makes the Model S feel rapid from the get-go; even the entry-level 75D that blasted from 0-60mph in just 4.3sec during our tests. But it’s the effortless delivery of that pace when you’re in the flow of traffic that makes the 75D so relaxing to drive. For general driving you don't need any more oomph, which is why it’s our pick of the range. Indeed, you could argue that the range-topping P100D is a bit too fast for the road. Up to motorway speeds, it will literally out-drag supercars, let alone the [Panamera](https://www.whatcar.com/porsche/panamera/hatchback/review/) Turbo, and safely using that kind of performance on the road is virtually impossible. Slowing down takes a little more getting used to, because the strong regenerative braking that helps charge the batteries causes the Model S to decelerate quickly as soon as you lift off the accelerator. But once you've adapted, it's actually quite welcome; in general traffic, you can drive the Model S using one pedal only, unless you’re coming to a complete stop. You can also adjust how hard the regenerative braking is, including making it harsher to help deliver more charge to the batteries. The brakes themselves are strong but, like in most electric cars, don’t have a completely natural, progressive feel. What about range? Well, there are many factors that reduce an electric car’s range, including cold weather, using lots of power-zapping functions such as the heater or air conditioning, long periods of fast motorway driving (with no ability to regenerate electricity during braking) and simply accelerating hard everywhere. The point is, you're unlikely to achieve the ranges quoted, but even the 75D has one of the best ranges of any electric car; during our testing, conducted on a warm day with the air-con set to 21C, we managed an excellent 200 miles between charges. In the same test on the same day, the I-Pace managed 177 miles. The Model S provides a pretty comfortable way to travel. On standard air suspension the ride is impressive, as long as you avoid the big 21in wheels. Only scruffy urban roads tend to unsettle it, and even then it stays on the right side of compliant. And it's at its best on motorways, making it a fine long-distance cruiser. When you find yourself on the motorway, you can make use of Tesla’s Enhanced Autopilot system (assuming you’ve chosen to specify it). This not only maintains a pre-set speed and keeps the Model S a safe distance from the car in front, but takes care of the steering as well – even changing lanes when asked, once it spots a safe gap in the traffic. It’s surprisingly effective at making long journeys less tiring and is without doubt the best semi-autonomous driving system currently on the market. You still have to keep your hands on the wheel and your attention on the road, though, because as with all these systems, Enhanced Autopilot can hand back control quite suddenly. 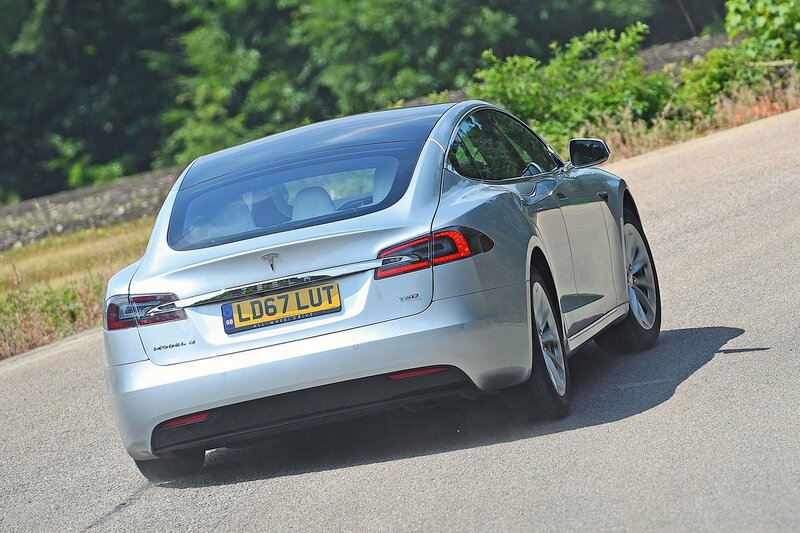 The Model S even handles very well for a car so big and heavy, with modest body roll, plenty of grip and loads of traction from its four-wheel-drive system. That said, those looking for a true sporting grand touring car will find the Panamera has far greater agility, with more accurate, feelsome steering and a better-balanced chassis. In the electric car class, though, the Model S is marginally more satisfying to drive quickly than the taller and less agile I-Pace.